I've haven't had the chance to play in the last few Taylored Expressions cupcake challenges, so this was the first sketch I decided to play with over the weekend. I used Taylor's sketch #56. 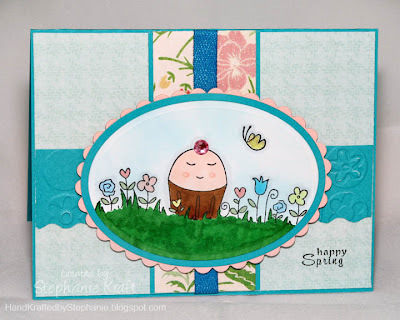 I stamped the spring cuppie surrounded by flowers, sponged the sky background and colored the rest with Copics. It was my first attempt at coloring grass and I was going for the spiky look -- I need to practice more with that. I cut the scalloped border on my horizontal cardstock strip with the Ric Rac Scalloped Pierceabilities, then used the Bloom Dots embossing folder for some added texture. I added some bling with a rhinestone and some stickles on the butterfly. I'm not sure why the ribbon looks like such a different color than the cardstock - in real life it is a much better match! This is just one of several sweet cuppie images to use throughout the year! Accessories: Petite Oval Nestabilities and Ric Rac Scalloped Pierceabilities (Spellbinders), Bloom Dots embossing folder and Cuttlebug (Provo Craft), Markers (Copic), Star Dust Stickles (Ranger), rhinestone (Imaginisce), ribbon, foam tape.